The Attorney General faces pressure to withdraw himself from an investigation into Russian meddling in the 2016 presidential election. WASHINGTON: Influential Republicans joined a chorus of Democrats Thursday in calling on Attorney General Jeff Sessions to withdraw from an investigation into Russian meddling in the 2016 presidential election after revelations he twice met with the Russian ambassador and didn't say so when pressed by Congress. The White House stood behind Sessions, though officials said they first learned about his contacts with the ambassador from a reporter Wednesday night. President Donald Trump said he had "total" confidence in him and didn't think he needed to step aside from the investigation. 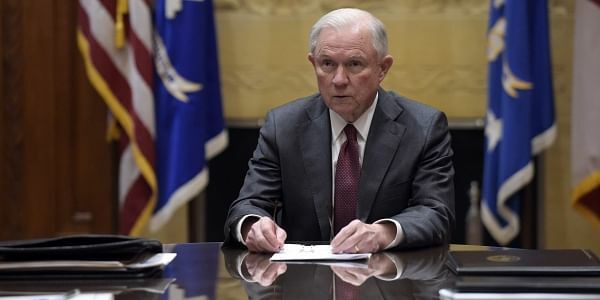 The Justice Department maintained there was nothing improper about Sessions' contacts or his answers to Congress, while the continuing allegations of Russian interference in American politics spurred Democratic calls for Sessions not only to recuse himself but to resign. Sessions is facing increasing demands to resolve the seeming contradiction between his two conversations in the summer and fall with Moscow's U.S. envoy, Sergey Kislyak, and his sworn statements to Congress in January, when he said he had not had communications with Russians during the campaign. Calling for Sessions to resign, House Minority Leader Nancy Pelosi accused him of "lying under oath." Senate Democratic leader Chuck Schumer said a special prosecutor should be appointed to examine whether the federal investigation into the Kremlin's meddling in the U.S. election — and into possible contacts between Trump associates and Russians — had been compromised by Sessions. Democrats also sought a criminal perjury investigation. "If there was nothing wrong, why don't you just tell the truth?" Schumer said. Sessions' testimony "was definitely extremely misleading to say the least." And more than a half dozen Republican lawmakers, including some who consider themselves personally close to Sessions, urged him to recuse himself from the Justice Department probe. They include Sen. Tom Cole of Oklahoma, who said that though he found it impossible to believe that Sessions could have colluded with Russia, "If there is an investigation, he probably shouldn't be the person leading it." Sessions told MSNBC on Thursday that, "when it's appropriate, I will recuse myself" from the investigation. The news comes on the heels of what had been the high point of Trump's young presidency: a well-received address to Congress Tuesday night that energized Republicans and appeared to wipe away some lawmakers' concerns about the administration's tumultuous start. Trump has been trailed for months by questions about potential ties to Russia. He's vigorously denied being aware of any contacts his associates had with Russia during the campaign and has also insisted he has no financial ties to Russia. The Justice Department acknowledged two separate Sessions interactions with Kislyak, both after cybersecurity firms had concluded that Russian intelligence agencies were behind cyber-hacking of the Democratic National Committee. The first occurred after a Heritage Foundation event during the Republican National Convention in July, when the department says a group of envoys — including the Russian ambassador — approached Sessions. The second was a September conversation, which the department likened to the more than 25 conversations Sessions had with foreign ambassadors last year as a senior member of the Senate Armed Services Committee. While there is nothing necessarily nefarious or even unusual about a member of Congress meeting with a foreign ambassador, typically members of the Senate Foreign Relations Committee meet with foreign ambassadors, not Armed Services Committee lawmakers, whose responsibility is oversight of the military and the Pentagon. Congressional contact with Russian officials was limited after the invasion of Crimea and due to Moscow's close relationship with Syria, a pariah for much of the West. But Sessions, an early supporter of Trump's candidacy and a policy adviser during the campaign, did not disclose those discussions at his Senate confirmation hearing in January when asked what he would do if "anyone affiliated" with the campaign had been in contact with officials of the Russian government. Sessions replied that he had not had communications with the Russians, and answered "no" in a separate written questionnaire when asked about contacts regarding the election. In a statement Wednesday, Sessions said: "I never met with any Russian officials to discuss issues of the campaign. I have no idea what this allegation is about. It is false." White House spokeswoman Sarah Huckabee Sanders called the disclosure of the talks with Kislyak "the latest attack against the Trump administration by partisan Democrats." At the confirmation hearing in January, Sen. Al Franken, D-Minn., asked Sessions about allegations of contact between Russia and Trump aides during the 2016 election. Sessions said, "I have been called a surrogate at a time or two in that campaign and I didn't have, did not have communications with the Russians, and I'm unable to comment on it."